Here’s something special for Labor Day weekend: Turn grilled fruit into tropical fruit skewers. Thanks to Melissas.com, purveyors of premium produce, for the recipe. We’ve also got dessert shots to go with the fruit: delicious coconut- or banana-flavored rum from Blue Chair Bay. 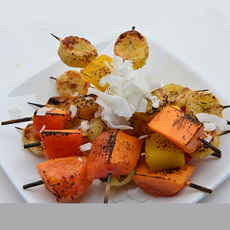 Grilled fruit skewers topped with coconut chips. Photo courtesy Melissas.com. Variation: Pineapple is also a tropical fruit. Feel free to add some. 1. COMBINE the brown sugar, orange juice and sesame seeds in a large bowl. Add the cubes of mango, papaya and bananas, tossing gently to coat thoroughly. 2. THREAD the fruit onto skewers alternating the fruits. 3. GRILL over a medium hot barbeque or hibachi for approximately 4-5 minutes per side. You can also use a grill pan or broiler. Be sure to watch closely so the fruit does not burn. 4. REMOVE to a serving plate and sprinkle with shredded coconut.